This is one of the prompts I picked up as a pitch artist and so glad I did because I discovered it was for a friend on my own flist. <3 Yay! Made it extra special. I created this illustration for milly_gal for the gift exchange spn_summergen. Artist Notes: Went with prompt 4 (Body Swap - Castiel in Sam's body, Sam in Dean's body, Dean in Castiel's body) because it sounded fun but did take me a bit to figure out how to do it by drawing it but I think it was a success. 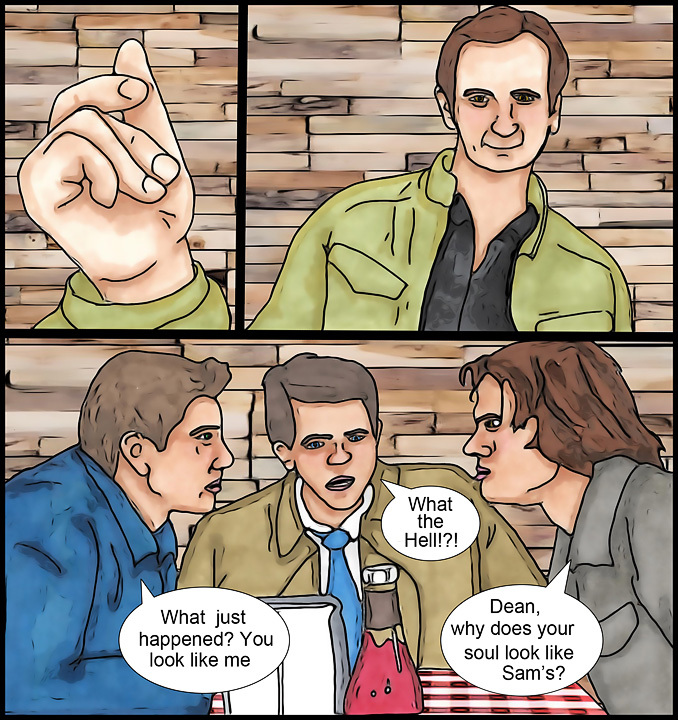 Summary: Dean, Sam and Castiel conversing at a local diner about a case. They do not see Gabriel appear. When Gabriel looks upon the three, a wicked idea pops in his head and with a snap of his fingers chaos ensues. And the three of them looking at each other like wtf!